Lucky the Roo, surveying his domain. I ended up harvesting the last of the potatoes within two weeks of the initial harvest. I never got around to writing about it, as the yield was okay, but nothing to write home about (although others have had better results). That said, I like the compact growing method of the tower, and will try again next year. Definitely want to try growing sweet potatoes, and I think our weather here will support the process. In the towers themselves, will probably try a 50/50 compost/soil mixture next time, with a bit of organic phosphorus added, instead of using pure compost. Some day I'll test the compost we make here on the property, but I imagine it's fairly high in nitrogen due to the large amounts of wood shavings and chicken poo from cleaning out the coop. Another thing I learned: if you want fresh potatoes to last for more than a few days, you need to cure them. Whodathunkit? Not I, and I was hoppin' mad at myself for letting the spuds go to waste like that. Tsk! I've been jonesing for a massive rainwater collection system. I dream of freedom from the 40-pound salt bags, and no more heavy mineral smells. I long for squeaky-clean shiny dishes, clothes that line-dry soft, and hair that doesn't need a weekly vinegar soaking to be rid of mineral buildup. I've promised Spouse, however, that we'll get his the garage-slash-pottery studio built first. It's been a slow process saving up the money for the build, but I'd much rather build as we can afford than to take out a loan in this economy. Anyhow: rainwater collection. Right. There's a bit more involved than one would think at first glance. Our neighbors down the road have a wonderful system, and they've graciously pointed out some of the issues and pitfalls we need to know. But in the meantime, I've decided to ease that rainwater collection jones a bit by doing something much smaller in scale, and out of my own discretionary funds: fitting our chicken coop with a miniature rainwater collection system. Our chicken coop is a 10'x10' modified big-box hardware store pre-fab shed. The measly 100 square foot roof could potentially collect 1500 gallons of water a year (with below-average 25" annual rainfall) according to Tank Depot's online calculator. The roof is made of corrugated metal, which is a good medium for rainwater collection but has its issues like any other roofing material. Some are of the opinion that to be absolutely safe for drinking (potable), metal roofing should get an approved protective coating of paint to guard against oxidized runoff, but for the chicken coop, I might hold off until/if we decide to get our house roof covered. If an emergency comes up, we can always use a commercial filter like a Brita to get any possible metals filtered, and then for pathogen deterrence either do solar pasteurization in our Sun Oven or use a bit of chlorine bleach. 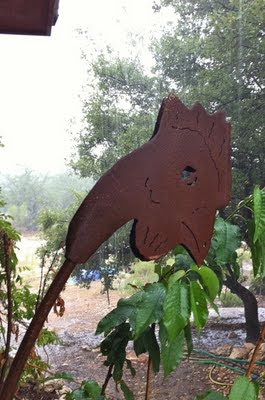 photo: metal chicken sculpture getting soaked during a rare Summer 2011 rain. 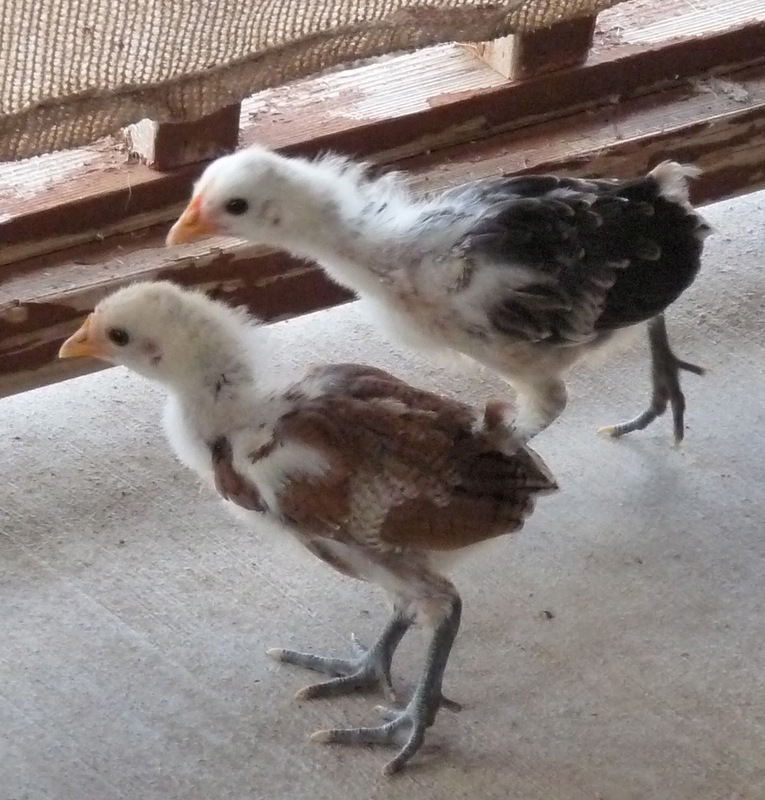 Pic: Molly's brave little chicks exploring the front porch.